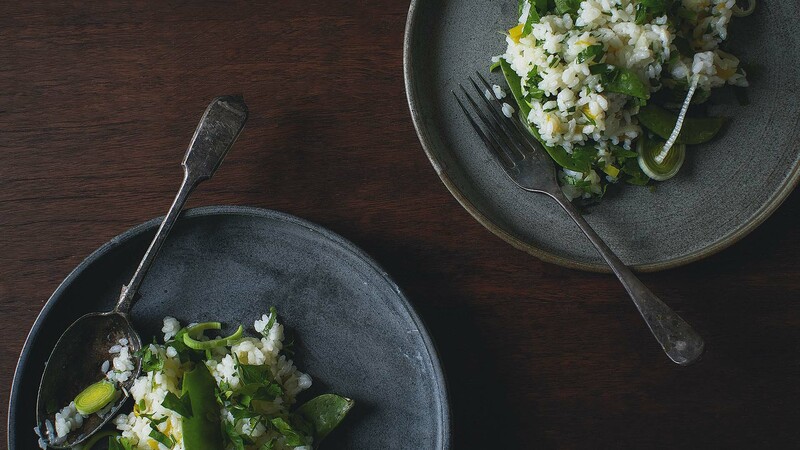 A deliciously satisfying vegetable risotto, perfect for winter. To make risotto, you add stock a little at a time to the pan of rice and wait for the rice to absorb it. Adding the stock warm ensures the rice keeps cooking, rather than going cold and heating up again. You’ll need to keep a pot of warm stock close to your risotto pot. The arborio rice variety is traditionally used in risotto as it is short and fat and can absorb a lot of liquid without going gluggy. For the perfect risotto, you want the rice to be soft but with a tiny bit of nuttiness at the centre – it’s all about texture. 1. Heat the stock in the medium saucepan. 3. Heat the olive oil in the large pot, add the leek and stir for 4–5 minutes or until the leek is soft. 4. Add the rice and turn up the heat, keep stirring it. After a minute it will look slightly translucent. 5. Add your first ladle of hot stock and stir. 6. Lower the heat and continue adding stock, stirring and allowing each ladle to be fully absorbed. 7. Add peas and cook until tender. 8. Test the rice; it should be soft but with a slight bite. 9. Remove from the heat and add the salt, pepper, butter, herbs and parmesan. 10. Taste and adjust seasoning as necessary. 11. Cover and rest for 2 minutes before serving.